Supports Resolutions up to 1920 x 1200 @ 60 Hz. Bus Powered, no additional power required. Active adapter supports Eyefinity and other multi-monitor solutions. Display Port Male to HDMI Female. 7 Inch cable for increased flexibility. 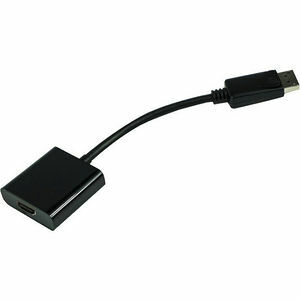 Adapt a DisplayPort Source to HDMI computer monitor. Fully compatible with DisplayPort 1.1 and up. Supports Resolutions up to 1920x1080 @ 60Hz. Bus powered; no external power required. Fully supports Eyefinity and other multi-monitor solutions requiring active adapters.